Each figure begins with thorough research of the breed. I often travel across the globe to visit heritage farms, attend agricultural shows, and meet with breeders dedicated to the stewardship and conservation of ancient breeds of livestock. Once I feel that I have an understanding of an animal and its specific traits and personality, the first step of the artistic process is to carve the heads, legs, horns and other parts that will eventually be cast in porcelain. 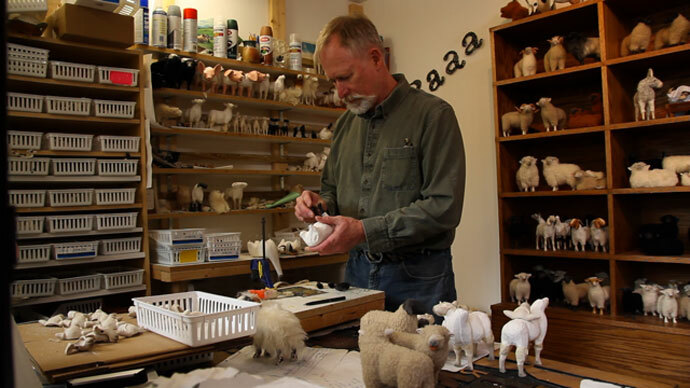 I use porcelain for its ability to capture the expressive nature of my wooly creatures. The next step is to create the body out of hydrostone, which I use for its stability and great weight in the hand (a 6" sheep weighs one pound). When the creature is formed, I finish it with high-quality imported fur – and the result is a life-like creature with personality and charm.